Badam milk prepared with Badam powder mix is a very popular beverage in India that tastes amazing yet is healthy as well. Badam Milk powder mix contains only healthy dried fruits and nuts without artificial colors and flavors. NUTRITION AND HEALTH BENEFITS OF ALMONDS Almond (Badam) acts as a very good substitute for coconut. If you are a vegan, Almonds fill in most for the milk’s nutrition. Almonds contain lot of protein, calcium and vitamin B complex. It is very rich in Vitamin A, riboflavin and niacin (increases HDL and reduces triglycerides). 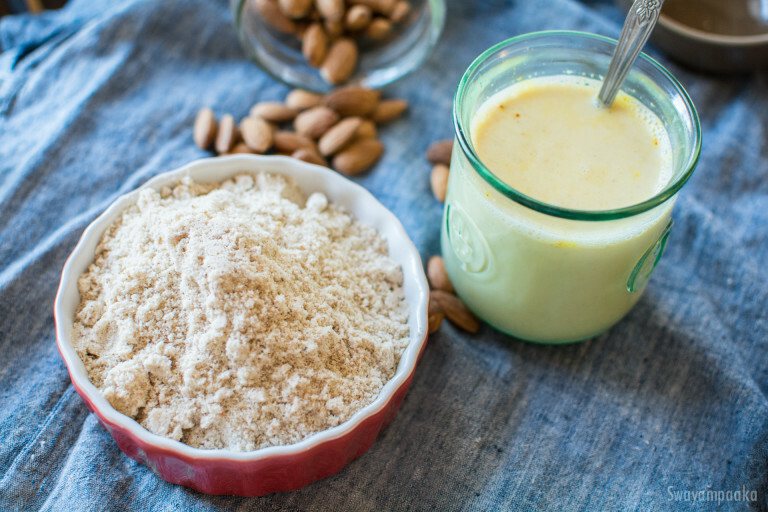 To make this tasty healthy badam milk powder (protein mix), put all the ingredients to the mixer and grind it until it becomes a fine powder. That is all. Now the powder is ready to use. Put one spoon of Badam milk mix to a cup of hot milk, mix it well and drink. Enjoy this Badam Milk hot or cold! How long can it be stored? you can store this for a month.